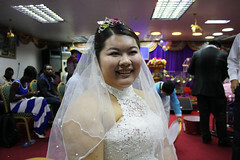 In the first six months of 2014, I researched the growing trend for African men marrying Chinese wives in Guangzhou, and start mixed families. The project involved attending underground churches, late night hip hop concerts, integrated kindergartens, many wholesale wharehouses and connecting with the unofficial General Consulates each African community appoints. I found African husbands of Chinese wives receive no greater rights than a tourist on the mainland, and live in fear of being separated from their families and businesses. Yet, the allure of the Chinese dream is so strong, few migrants can bring themselves to leave.